If you’re planning a trip to Cuba, you must already be thinking of cheap mojitos, salsa dancing, colonial buildings and those amazing old-fashioned cars! Because we know you’re too busy daydreaming and don’t have much time left to look for the perfect hostel, we put together a little selection of the hostels in Havana with the best vibes. Most hostels in Havana are family homes that have special permission to host guests, so don’t expect huge hostels, but more of a community feeling. In many hostels breakfast is not included, but you can get it in the house for 3-5 CUC. The delicious typical breakfast includes juicy fruits, a fresh made omelette, some bread and coffee. In some houses you can also find jam, ham and cheese. Among the things to do in Havana, one of my favourites is to stroll down Paseo del Prado, a big street with many artists selling their art that reminds me of La Rambla in Barcelona, but less crowded. As you arrive to the coast, continue to walk along the Malecon in the seaside which is also lovely. Another one of my top 5 activities in Havana is the Callejón de Hamel, a colourful street that locals use as a cultural space. You can listen to music, see people dancing and even venture into a beautiful art gallery. If you can you should go on a Sunday, when most of the shows take place. The best thing is that even though tourists are welcome, it’s a creative space designed by and for local people. Some of the neighbourhoods you shouldn’t miss are Havana Vieja, the oldest part of the city; Centro Havana, where you can see the old colonial buildings and where you can find China Town and the vibrant Callejón de Hamel I mentioned before; and El Vedado, the most modern part of the city where you’ll find the popular Plaza de la Revolución. To eat cheap in Havana, you just have to get out of the main squares and look patiently. Ideally, I’d love to always eat in local places, but those aren’t always easy to find. Even though some dishes, like “ropavieja”, are incredibly tasty, don’t expect elaborate meals with a million ingredients. Most of the time restaurants don’t have everything on the menu – not even in the fanciest places. If you want to see the city from the top, head to the terrace of one of the historical and beautiful hotels in Havana, like El Nacional, and have a nice drink (or not, it isn’t required in order to see the views). Read on for our list of the best hostels in Havana! Travelling solo to Cuba is a great adventure, and it’s even better when the hostel vibe makes it easier to meet people! Contrary to many beliefs, Cuba isn’t a dangerous country for tourists. Locals are very careful with tourists and treat them very well, since they provide their biggest source of knowledge of the “outside world” and of money (at least for working class people!). Many Cubans speak very good English and will be very sociable. They will love to hear everything about your country and your life – in return, they will tell you everything about theirs! Between other backpackers and local people, you’ll never feel alone on your solo trip to Havana. This colonial building beautifully restored in 2009 is a gem for solo travellers. It’s located in Havana Centro, where you can find many attractions like the Capitolio, the Malecon and the Paseo del Prado. The guests say it’s super easy to meet people, the staff are very helpful and the location is just exceptional. Enzo and his mum, the owners, are very loved by our backpacker community. They’ve helped many backpackers to explore Havana and even to continue their trip around Cuba by giving good and wise advice. The hostel is very close to Plaza de la Revolución, a must see in Havana. Sounds like a dream come true: “Had a blast in Havana, and you really can’t pick a better place for value than this hostel. Nilda and Denise (Nilda’s daughter) are very welcoming and take care of you. The place is right next to the baseball stadium (Estadio Latino) and it is a quick 10 minutes in a cab to Old Havana. The area is also very safe at practically any time of night. It’s also a good spot to meet other travellers. I would stay here again”. Breakfast on the terrace, lovely international fellow backpackers and clean private rooms in the heart of Havana, what else can we ask for? 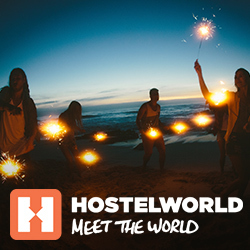 With the amazing atmosphere of this hostel, it’s impossible not to make friends, even if you aren’t in a shared room! The super helpful staff will give you tips for exploring Havana and continuing your trip around Cuba. They. Have. Wi-fi. * They also prepare killer cheap cocktails, which will make it difficult to leave the place! Luckily enough, you’ll be in Centro Havana, super close to almost everything in the city. Guess who won the award for The Best Hostel in Cuba in our 2019 HOSCARs? *In Cuba, wi-fi is very difficult to find. Usually it’s available only in big squares. Yo-ho-ho and a bottle of rum! No, you won’t become a pirate, but you’ll probably ingest more rum in these holidays than you’ve had in your whole life. Are you a mojito fan? Or maybe you’ll go for a creamy piña colada? One thing’s for sure – you won’t be able to escape the staff of the following hostels offering you a classic Cuba libre. On the top floor of a classic Cuban apartment building, this hostel has everything you need to have a killer time: nice people, a music player, and a bar. From only £3.91 you can have a bed in Casa de Hatuey, and the price is not even the best thing here! Travellers from all over the world gather every night in the common area of the hostel creating a little family of backpackers (yes, backpackers drowning in rum, but still backpackers). Located in Havana Centro, the hostel is close to everything but far from tourists, which makes the area super cheap to eat and drink. The rooftop bar of this hostel fills every night with a great atmosphere. Guests love this hostel because it feels like home. It’s not in a touristy area, but it’s 5 minutes walking to the Malecon and 15 to Old Havana. They offer delicious breakfast and dinner at a very good price! This beautiful colonial building in Centro Havana is close to everything you might need, including bars and places to dance! There is a terrace with a bar, which makes it super easy to make new friends to party with. They offer a delicious breakfast for 3 CUC (sometimes with homemade jam!). Did you decide where to stay on your trip to Havana? Have you already been to any of these hostels? How was it? Let us know in the comments! Have a great trip to Cuba!